On Tuesday evening - 12th January, a devastating earthquake rattled the nation of Haiti causing extensive damage and many thousands of deaths. The presidential palace, UN headquarters and many hotels, schools, churches and hospitals have all been reduced to rubble. Tens of thousands remain trapped and unaccounted for. Lemon aid has been working in Haiti primarily on the island of Lagonave just off the coast from the capital. There has been extensive damage on the island but due to the fact that Lagonave is not nearly as developed as the capital there was very few deaths on Lagonave. On Lagonave, homes tend to be shacks and single story so they are easy to get out of. The Wesleyan hospital that we work with has tended to many injured casualties. As you know they do this for free and provide free medicines and dressings where possible. Dan Irvine who oversees the hospital is putting a medic team together from the Lagonave hospital staff and along with medical supplies is heading to the mainland to see what extra help they can bring there too. They will set up an emergency clinic in a semi destroyed Wesleyan church complex in Port au Prince. Unfortunately day break yesterday revealed the earthquake had significantly damaged the existing Lagonave hospital building. The building was already in poor condition and Lemon Aid have been heading up the project to rebuild the hospital. The earthquake damage now requires us to speed up the fundraising to allow construction of the new facility and emergency repairs as soon as possible. A construction project manager and architect will visit the site with the medic team in March 2010 to assess priorities and set a new build timeline. We will not go before then as the airport is closed to commercial flights and roads in and out of the airport are cut off. The plans are already drawn for the new facility, its just the funds that are needed to make it happen. In the last few hours some Haitians from the mainland have started to make there way to the hospital on Lagonave for treatment. 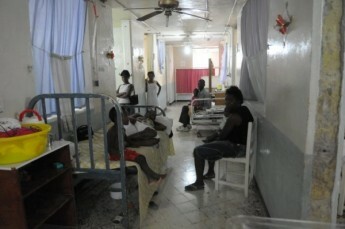 The Lagonave hospital is the only hospital on the island and with 33 beds struggles to cater for the 110,000 population. It is however the only place on the island where surgery can be carried out and caesarean sections performed. It is imperative that we find a way to protect and rebuild this facility for these precious Haitian people. If you can make a donation please do so as soon as possible. Lemon aid will direct any donations to areas most needed in the aftermath of the quake. We will look at what needs to go into protecting and rebuilding the Lagonave hospital. We will also rush funds to the emergency medic team to allow purchase of emergency medicines and medical supplies for use in Port au Prince or to treat quake survivors that turn up at the hospital. The price of fuel has rocketed in Haiti already which has led to the power in the hospital being withdrawn at night. When fuel is available we will forward funds to allow purchase of fuel for the hospital and emergency clinic generators. To make a donation to the Lemon Aid Haiti Earthquake appeal please go to our DONATE . If you have a credit or debit card you will find instructions under the donate tab at the paypal section. Click on the pay pal section and if you have a paypal account you can make a donation online, if you don't then click to say you would prefer to pay by card. We have negotiated extremely low rates for these transactions with PAYPAL. If you would rather pay by cheque you can download a Gift Aid declaration form to send in with your cheque donation made payable to Lemon Aid. If you have any questions then please email justin@lemonaid.org.uk or call Mike on 01383 631005.